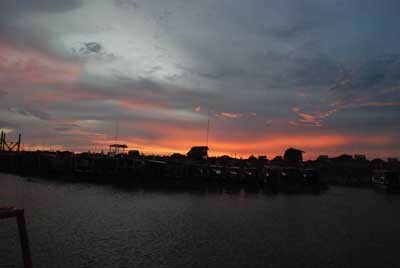 Among the non-temple related activities in Siem Reap is a visit to the floating village of Chong Kneas. A two-hour long boat ride to the village most recently cost $20 per person if you are less then ten people. Complete with driver and boat guide, the motorized boat goes through the floating village for about 1 hour. There is an opportunity to stop at the small floating schools and give materials (which can be bought somewhere in the village) to the students. The boat goes on to Tonle Sap lake, which joins the river in shrinking and expanding dramatically with the seasons, thereby causing villagers to move their floating houses to different points. The next tourist stop is at the cat fish and alligator farm / souvenir shop. Then the boat takes you back to the shore; the total trip is often over before two hours simply because there isn’t anything else to see. If your schedule allows, set aside a day or three to get out of the Siem Reap Town/main temple area and into the countryside. The vast majority of Cambodians live and work in the rural countryside and a countryside tour or even a day trip to a remote temple ruin can provide a glimpse of ‘real Cambodia’ - picturesque, bucolic scenery, rice paddies and water buffalos, countryside pagodas and little villages filled with traditional stilted houses... And there are a number of ways to see it. 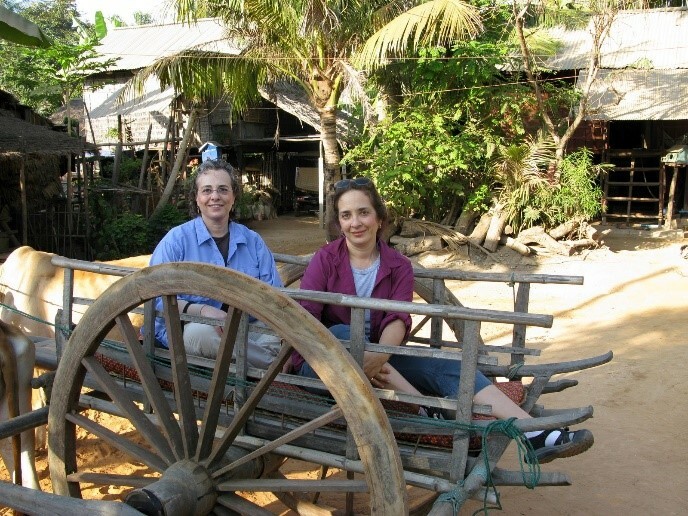 Helping the local farmer by taking the Oxen Cart rides through the village, rice fields Vegetable farm and the natural landscape of the countryside (oxen cart rides takes about 1 hour and cost 5-6$USD). A great way to get an inside looks at the real Cambodian life. 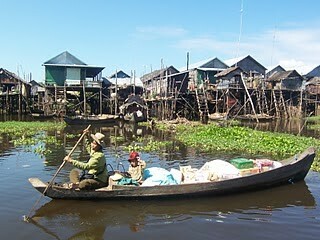 (Countryside tour always combine with the trip to floating Village). Kampong Phluk is a cluster of three villages of stilted houses built within the floodplain of the Tonle Sap about 16 km southeast of Siem Reap. The villages are primarily Khmer and have about 3000 inhabitants between them. Flooded mangrove forest surrounds the area and is home to a variety of wildlife including crab-eating macaques. During the dry season when the lake is low, the buildings in the villages seem to soar atop their 6-meter stilts exposed by the lack of water. At this time of year many of the villagers move out onto the lake and build temporary stilted houses. In the wet season when water level rises again, the villagers move back to their permanent houses on the floodplain, the stilts now hidden under the water. Kampong Phluk's economy is, as one might expect, based in fishing, primary in shrimp harvesting. Kampong Phluk sees comparatively few foreign visitors and offers a close look at the submerged forest and lakeside village life as yet unperturbed by tourism. The Exhibition on the Khmer Heritage is sponsored by Krousar Thmey, (which means "New Family" - a Cambodia-based NGO assisting children in Cambodia). 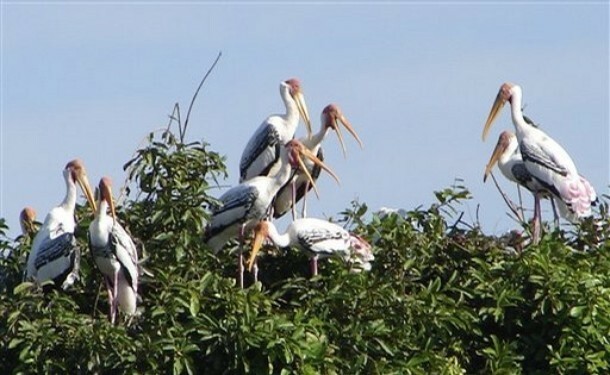 The current exhibition is dedicated to the Tonle Sap Lake and the people, culture and environment of the area. The displays are actually quite informative and include maps, photos, models of traditional houses, boats and fishing implements with written explanations in French, English and Khmer. The highlight of the exhibit is a working scale model of the Tonle Sap Lake. There are also exhibits on the work of Krousar Thmey. Open everyday. Closed noon till 2:00pm. Admission is free, donations accepted. Located on the road to Angkor Wat just past the Jayavarman VII hospital. 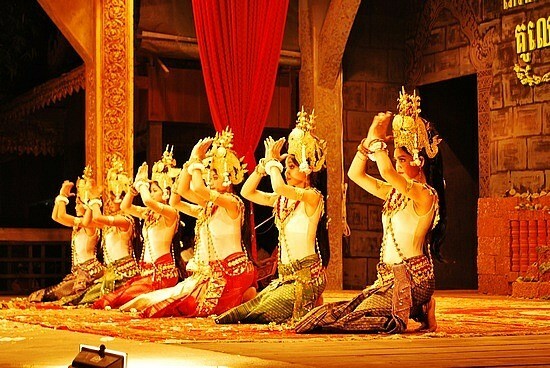 No visit to Cambodia is complete without attending at least one traditional Khmer dance performance, often referred to as ‘Apsara Dance’ after one of the most popular Classical dance pieces. Traditional Khmer dance is better described as ‘dance-drama’ in that the dances are not merely dance but are also meant to convey a story or message.As evidenced in part by the innumerable apsaras (celestial dancers) that adorn the walls of Angkorian and pre-Angkorian temples, dance has been part of Khmer culture for well more than a millennium, though there have been ruptures in the tradition over the centuries, making it impossible to precisely trace the source of the tradition. Much of traditional dance (especially Classical) is inspired by Angkorian-era art and themes, but the tradition has not been passed unbroken from the age of Angkor. Most traditional dances seen today were developed in the 18th through 20th centuries, beginning in earnest with a mid-19th century revival championed by King Ang Duong (reigned 1841-1869). The new National Museum in Siem Reap has recently opened and features the Angkor National Museum itself plus a Cultural Mall and shops. The museum’s 8 main galleries contain original artifacts restored by Angkor Conservation and a collection of 1000 Buddha statues. Other galleries focus on ancient clothing styles; the four principal kings of Angkor; the extant written material from the Angkor temples and the history and religion of pre-Angkor period. Innovative mixed-media displays tell the story of the Angkor civilization and multi-lingual tour guides and audio units are also available. 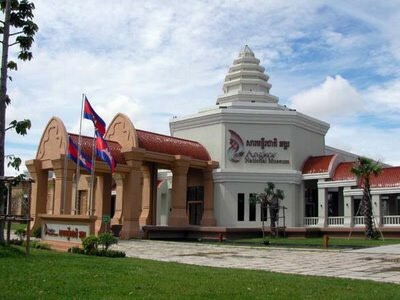 The Angkor National Museum is located on Charles de Gaul Boulevard heading north towards the Main Entrance to Angkor Wat. Entry costs $12 for foreigners Open 9.00am - 8.00pm. Founded by Mr. Akira, a former soldier and de-miner, this museum is a fascinating testament to Cambodia’s violent past, and to Aki Ra’s personal survival. It documents the story of Aki Ra’s life and experiences through a quarter of a century of war, and houses one of the world’s largest collections of decommissioned mines and other ordnance. Aki Ra is constantly seeking donations, and has recently founded an NGO, in cooperation with CLMMRF, to maximize his vision of “making my country safe for my people”. The museum is home to several young landmine victims taken in by Akira and his wife. This is a unique museum and a thoroughly worthwhile project that deserves your support. The museum is open from 7am to 6pm. Admission is free, but donations are gratefully accepted and much appreciated. NOTE: The Mine Museum is now on the right hand side of the road leading from Siem Reap to Banteay Srey. A unique, sprawling new cultural attraction in Siem Reap, intended to introduce the visitor to Cambodian culture and history. Wax museum with scenes and figures from history. Fascinating 1/20th scale models of sites such as Phsar Thmey and the Royal Palace in Phnom Penh and the hills and temples of Oudong. Full scale models of a variety of Cambodian architectural types, including different styles of huts and homes, hill tribe houses, pagoda and mosque. Live shows, traditional dance performances and music. Traditional Khmer wedding show twice per day. On Airport Road. Artisans Angkor was created in 1999 to help young people find work in their home villages, allowing them to practice their crafts while providing them with a vocation. It was created as part of a three-year project to integrate young artisans trained by the Chantiers-Ecoles de Formation Professionnelle - whose objective is to revive traditional craft skills (stone carving, wood carving, lacquering, gilding and silk processing). We place a strong emphasis on the authenticity of its products to the Khmer culture. In 2003, we became a limited company with minor public participation and are now completely self-financed. At our main boutique and workshops in Siem Reap, discover the traditional Khmer techniques used for stone and wood carving, lacquering and gilding, as explained by our experienced guides. 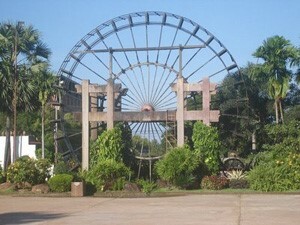 Complete tours of the workshops take you from raw materials to splendid craft-wares. 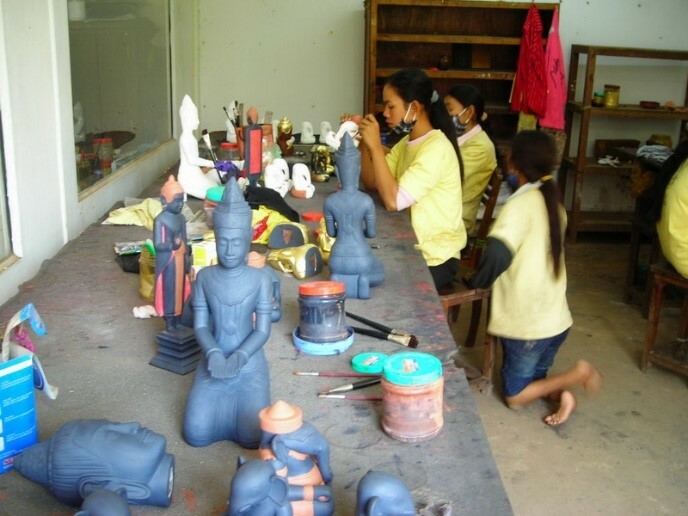 Tours are available in Khmer, English, French, German, Japanese, Chinese, and Thai daily from 7.30am to 5.30pm for the tour of the workshop, and to 6.30pm for the boutique. Angkor Silk Farm at Puok District, 16km from Siem Reap town, is a centre of exhibition on silk processes and production. Located on an 8 hectare site, mulberry fields, silk worm breeding and silk weaving using traditional Khmer knowledge are highlights of the centre. Open daily from 7.30am-5.30pm. We have three Duty-Free Boutiques located in the Phnom Penh International Airport, Siem Reap International Airport, and Hong Kong Airport. Contact your hotel, guesthouse or tour operator for more information. 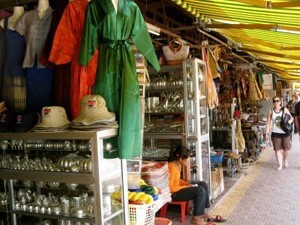 and the Old Market area are 'must sees' when visiting Siem Reap. Of the various traditional markets in the Siem Reap area, the Old Market is the most popular with tourists and visitors, offering the greatest selection of souvenirs and curios of any of the traditional markets. And the area around the Old Market is burgeoning with shops, galleries, restaurants, bars, massage and more. The Old Market is located on the river at the south end of the Old French Quarter. During the day and into the early evening the south side of the market near the river is alive with souvenir and silk vendors hawking a wide variety of Cambodian handicrafts, textiles, statues and curios. The Old Market is also a good place to pick up post cards, tee-shirts and other small items if you haven't already bought them from the vendors at the temples. The north half of the market caters primarily to the locals, vending fruit, vegetables, meats, clothes, appliances and such. A number of inexpensive food stalls line the northern edge, serving local fare in interesting though sometimes hygienically challenged conditions. The Old Market closes at sunset, but many of the souvenir vendors in south section of the market stay open past 8PM. Siem Reap’s nightlife stretches to near dawn these days with Pub Street coming to life around dusk and the last bars and clubs in town closing as late as 4:00AM. Nightlife venues are scattered across the town but many of the most popular bars and pubs are clustered in the Old Market area, especially along and around ‘Pub Street’. The bars in the area offer some great early evening happy hour deals and the street also has some of the latest running bars in town. 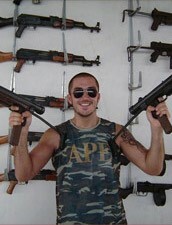 But the action is not limited to Pub Street. Less crowded, less touristy, more individual places can be found in the Wat Bo and Old Market areas, along the river road and on Sivutha Blvd. And for something completely different, check out one of the Cambodian discos or clubs such as Zone One and Sok San - DJs, dancing and a unique and varied selection of international and local music. The clubs get going around 10:00PM and close by 2:00 or 3:00AM. Off Sivatha Road: The Angkor Night Market is unique. Not only do the naturally constructed stalls display good quality local wares but many are stocked with original items from outside Siem Reap. This has earned The Angkor Night Market a well-deserved reputation of place where you can find different and unusual products not readily available elsewhere in the local area. The Island Bar and Brick House Bar stand out as two of the only places in town where traditional Cambodian culture and architecture are fused with a cosmopolitan feel in an open-air, ambient setting. Visit 3D Cinema located just beside Island bar. You can choose from several movies, every day. 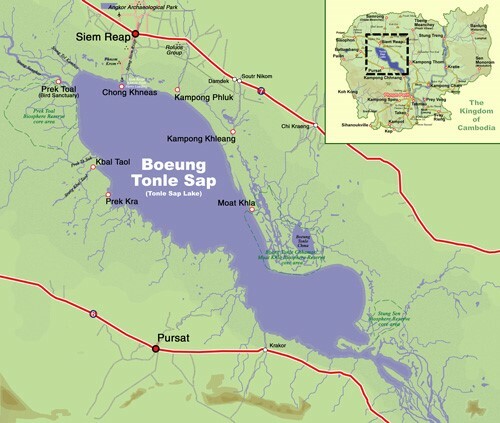 You can see where Brother 1 Pol Pot got the idea to start a revolution that killed millions of innocent. 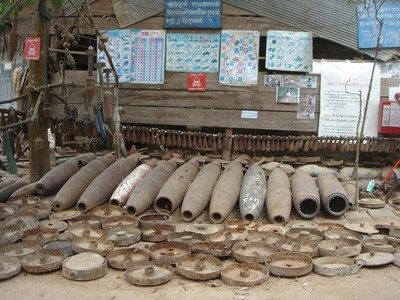 Who is responsible for 4 - 6 millions of landmines still buried in Cambodian soil? Or you can enjoy amazing documentary about the largest snake market in the world. 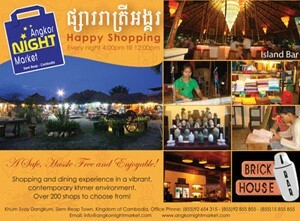 We provide the WiFi Internet access in Angkor Night Market - Island Bar - Brick House Bar. You can bring your laptop, buy ClickNet prepaid card and check your Email or surf your Internet. Many people think to come to Cambodia in addition to sightseeing attractions such as mountains or sea,angor wat,tourists want adventure tour or love challenges.But also need to travel relatively longtime. Or someone not have enough time. Cambodia Shooting Range, Siem Reap, Phnom Penh Cambodia. we have another option for tourists, who don't have enough time. 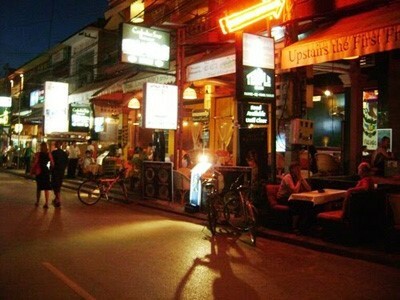 And we are located in downtown Cambodia, so you don't have spend a lot of time on the bus or Taxi. It takes only 1-2 hours including transfer from and to you hotel or any other place in Cambodia . Our large shooting range is distance of 25 meters with a capacity that will fit more than 20 people to shoot all at once. A technical will be present to instruct you at all times, so even a group of first timers, women or elderly may enjoy a safe and a pleasant shooting. And for serious shooters who wish to skill-up their shooting techniques and score-up their shooting ability, a well-trained officer may instruct you individually if requested.Gun shooting in Cambodia. We are open to all People, who are Interested in a new experiences, On a very safe level ! Times: Daily (9:00 am. - 17:00 pm.) all year.